When I left for work this morning, I didn’t expect that only a few hours later, I’d take part of The Great British Biscuit-Off by participating in a blind cookie taste testing. Yup, just another day at Ivanti. Seven months ago, Ivanti transferred me from their Salt Lake City headquarters to their Bracknell office, located right outside of London. 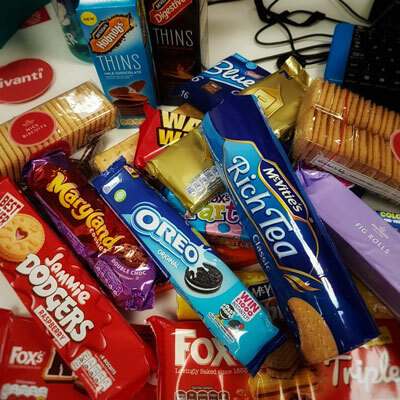 When my lovely British coworkers found out that I haven’t been sampling all of the sweet delicacies of the biscuit aisle at Sainsbury’s, immediate action had to be taken. We went straight to the grocery store and bought 20 different types of biscuits. Now let’s get one thing straight. A biscuit is a delicious, flakey warm roll served with gravy or loads of butter. But, since I’m in the UK, I’m playing ball in the office and referring to cookies as biscuits, because this is what it looks like to be a team player. We blindfolded the team and had everyone sample the variety of biscuits and guess which one is which. I’ve got to say, I was impressed by my colleagues' extensive biscuit knowledge. Most people guessed the correct biscuit immediately. Twenty cookies, one sugar rush, and a stomach ache later, I needed to take a moment to organise my thoughts on all of these foreign treats. 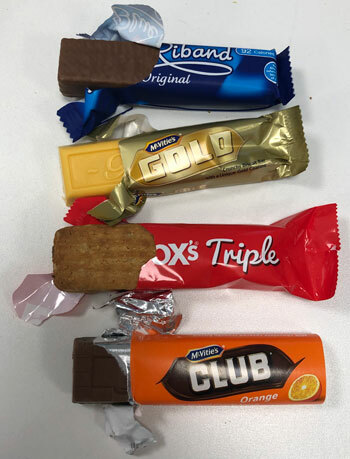 I now present to you the definitive British biscuit ranking, from worst to best. American equivalent: A Saltine without the salt. My thoughts: If you tap one of these biscuits against the table, it makes a hollow knocking noise like a piece of plywood. I feel like that’s everything you need to know about these. That being said, Sara Coppock insists the best way to eat these is by adding butter and jam on the top, but if your cookie needs you to BYOB (bring your own butter), I think it’s time to reevaluate your biscuits. Description: Currants in biscuit dough stretched thin. American equivalent: Think of a sweet piece of dried pita bread stuffed with raisins. My thoughts: I don’t understand why this biscuit needs to exist. Description: A spongy cookie topped with orange jelly and chocolate. Description: Wagon wheels are two biscuits (similar to graham crackers) filled with marshmallow and jam, all squished together and dipped in chocolate. You can’t make this sh*t up. American equivalent: A Moon Pie. My thoughts: These are the weirdest cookies I’ve ever had. Description: Flat circles topped with royal icing in bright colours. American equivalent: Remember the white and pink circus animal cookies with sprinkles you ate as a child? Party Rings are kind of like that, but the frosting is hardened. My thoughts: Great for kids, probably a little too sweet for most adults. Description: A soft, sweet roll with fig paste in the middle. American equivalent: Essentially a Fig Newton, the cookie nobody in America cares about. My thoughts: “I’m in the mood for a Fig Roll,” said no one ever. It does the job if you’re desperate for sugar. My thoughts: I think they’re a bit dry, but I hear they are better if you dip them in your tea. Description: A chocolate covered oat biscuit. Kind of like Hobnob with more chocolate and a thicker cookie. American equivalent: A thicker version of a Kit Kat. My thoughts: It’s fine, nothing special. My thoughts: They taste sort of nostalgic for me and are super sweet. Description: Hard chocolate chip cookies. American equivalent: Identical to Chips Ahoy cookies. My thoughts: Eh, pretty good. Description: Two vanilla cookies with vanilla buttercream in the middle. American equivalent: Golden Oreos, but better. My thoughts: These are quite nice and great with tea. American equivalent: We have this in the USA too. My thoughts: Shortbread is kind of funny. We have it in America, but it’s not something you ever really go out and buy. People don’t crave shortbread, but if you have a packet in front of you, you’ll happily snack on it. And really, who am I to turn down this humble little combination of sugar, butter, and flour? Description: White chocolate bar with a vanilla cookie inside. American equivalent: This tastes sort of like a Hersey’s Cookies and Cream bar, with a vanilla cookie instead of a chocolate cookie. My thoughts: Just as a warning, when I read that the bar was called “Gold,” I didn’t think that meant it was actually bright yellow. Once you get past the shocking color, the taste is quite delicious. Description: Two coconut biscuits filled with a chocolate frosting. American equivalent: I don’t think we have something similar to this. My thoughts: I love coconut, so I was a fan of these. The coconut is also a nice addition to differentiate these, as a lot of British cookies are just variations of chocolate and biscuits in different shapes. Description: Cute little shortbread cookies with jam in-between, topped with a little jam heart. American equivalent: I can’t think of anything quite like this in the USA. My thoughts: These get an A+ for presentation. They’re adorable and look like Valentine’s Day condensed down in a cookie. Description: A coconut flavoured biscuit similar to shortbread but slightly less sweet. American equivalent: I think shortbread is as close as we get to this. My thoughts: I went through a few different stages with this biscuit. At first, I thought it was boring. As I let it sit on my palette a bit longer, I enjoyed it more. The aftertaste was so perfectly sweet and simple, I kept going back for more. Nice biscuits didn’t win the #1 spot for me, but they deserve an honorable mention for reminding me that it’s what’s on the inside that counts. Description: Another biscuit sandwich filled with chocolate frosting, kind of like the Triple minus coconut. The difference is the whole sandwich is covered in smooth milk chocolate. American equivalent: Nothing quite like this, but they do remind me of Tim Tams if you have tried those. My thoughts: I think it is mostly the chocolate to cookie ratio that makes these so good. Plus, each wrapper has a penguin-themed joke on it, so that’s a fun addition that sets these apart. Description: A plain biscuit, covered in orange cream, covered in an extra layer of chocolate. American equivalent: This tastes like a crunchy chocolate orange. My thoughts: This is the Christmas treat I never knew I needed. Great to tide you over January-November when you are missing Terry’s Chocolate Oranges. Description: A simple biscuit with smooth chocolate on top. American equivalent: Chocolate covered graham crackers, but better. My thoughts: A classic. Don’t let the name put you off. They may sound like the medicine you take when your stomach is upset, but Digestives are a modern masterpiece. The perfect treat to eat solo or with a cup of tea. Description: Oaty biscuits topped with chocolate. American equivalent: Hobnobs are a little piece of heaven that American hasn’t mastered yet. My thoughts: This has everything you want in a British food – delicious British chocolate, adorable name. 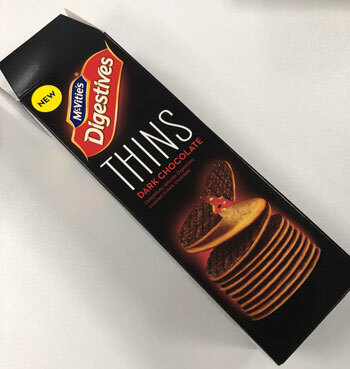 I also recommend Hobnob Thins (think of what Oreo thins are to regular Oreos); because “Thin” is in the title, you almost feel healthy as you eat an entire package in one sitting. I’ve got to say, working at a company with spontaneous biscuit tastings is a blast. Better yet, when eating so many biscuits rots my teeth and spikes my blood sugar, Ivanti also provides great health and dental benefits I look forward to taking advantage of. It’s pretty special to work in a company culture where you are surrounded by such cool coworkers. Moving to another continent is hard, but the Ivanti family has taken care of me every step of the way. If you’re interested in a new career, I can’t recommend Ivanti enough. Keep an eye on our careers page to find the perfect opportunity for you.